A proper preparation of the patient for cell transplantation is mandatory. The patient has to be brought into as good a metabolic state as possible by standard therapeutic means, i.e. to carry out cell transplantation, while for example, the diabetic patient is in the state of ketosis, hyperosmolality or prolonged hypoglycaemia, is probably minimally effective and should be done only as a last resort. Patient must also be detoxified, which means in particular the treatment of the gastrointestinal tract: forgotten nowadays, treatments by digestive enzymes, bacterial symbionts, enema(s), as well as dietary modifications(high fiber diets, etc.) are necessary. Oral fluids must be forced for 24 hours before the treatment unless otherwise contraindicated. Patient must receive an optimum dosage of vitamins and minerals for 4 weeks prior to cell transplantation. Patient's body must be free of any medications that are not absolutely necessary at the time of transplantation. The patient must not drink any alcohol for 48 hours before cell transplantation and substantially cut down on smoking. There must be no exposure to x-ray, or any other from of electromagnetic energy for 3 days prior to cell transplantation. 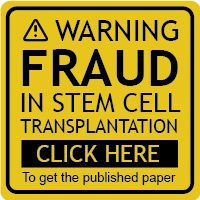 Patient must have no vaccinations or any serum therapy for 4 weeks before cell transplantation. After cell transplantation, these precautions and additional therapeutic measures must be prolonged for another 4 weeks. Understanding and following the above information is important. Now you may return to our procedure and program section.